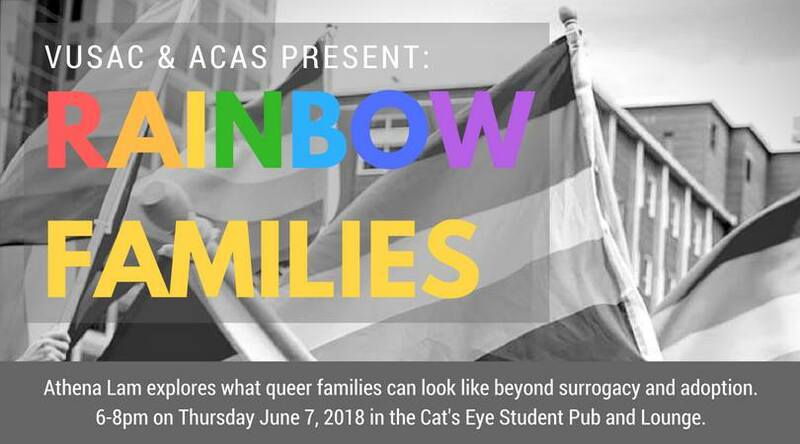 Join Asian Community AIDS Services (ACAS) and Victoria University Students’ Administrative Council (VUSAC) in the Cat’s Eye Student Pub and Lounge on Thursday, June 7th from 6-8pm. Athena Lam will be exploring what queer families can look like beyond surrogacy and adoption. We’lloldring have light snacks and refreshments! The Cat’s Eye is accessible to mobility devices and located at 150 Charles St. West in Toronto. The nearest TTC stop is Museum Station. If you require any accommodations to comfortably attend this event, email president@vusac.ca and we’ll work to make appropriate arrangements.